Have you ever seen a koala bear in the zoo or in the wild? If you live in Australia, chances are you have seen one in the "bush" (Columbia Encyclopedia, 2007) or forest. They are called the "Australian bear" Columbia Encyclopedia, 2007), because they are primarily found in the forest of Australia. Basically, you will find them hanging out in a tree and eating the branches from it. Most Koalas love the "eucalyptus tree" (Columbia Encyclopedia, 2007), since it has special nutrients that are essential to a koala's diet. The "koala's habitat" (TheKoalas, 2007) varies; however they prefer to live in some type of forest. They can even be found in sub-tropical forest of Australia. This nocturnal marsupial prefers moving at night and sleeping during the day. They enjoy eating many types of leaves, which gives them the nourishment that they need daily. 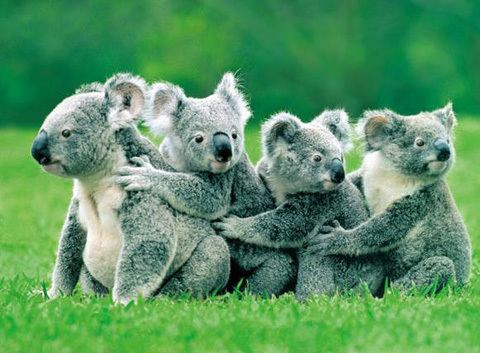 Koalas are very social with other koalas, but they become aggressive when provoked or threatened by a predator.